Six weeks ahead of his return to the ring against Robert “The Ghost” Guerrero, boxing’s top biggest name and cash king, Floyd Mayweather, used an interview with fighthype.com to fire a series of verbal jabs… at 168-pound champ Andre Ward. Apparently Ward, the best boxer on the planet not named Mayweather, is a long-time friend of Guerrero’s and hopes the Ghost achieves an upset victory May 4. And moving on to Ward’s (lack of) marketability. Not knocking Andre Ward, but he can’t sell tickets nowhere. He can’t sell tickets in Las Vegas. This is the only guy I know that’s a gold medalist, but don’t nobody know he’s a gold medalist. He’s a gold medalist, but he’s making money like he don’t even got a medal. 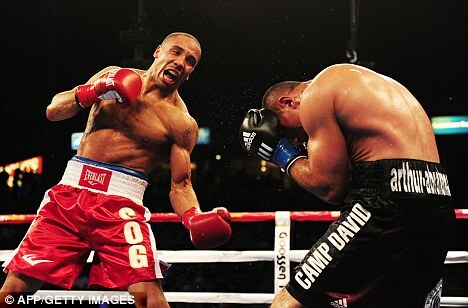 Like I said before, Andre Ward, he’s a good fighter, but who knows him? If you’re not in Oakland, you don’t even know who he is. He’s getting older and time is ticking, so I mean, when is he going to ever leave Oakland and put asses in seats somewhere else? Predictably, a flurry of responses, counter-responses and runaway internet hype about catch-weight challenges that prompted Ward himself to speak out in the interest of stopping the madness. Still, a few aspects of this debate bear closer scrutiny. Mayweather’s never heard of this guy? 2. Is James Prince the common denominator? Shortly after Mayweather’s comments hit the internet Ward’s manager, James Prince, responded with shots of his own. Prince managed Mayweather early in Floyd’s career and clearly didn’t appreciate his former protegé criticizing his current star pupil. 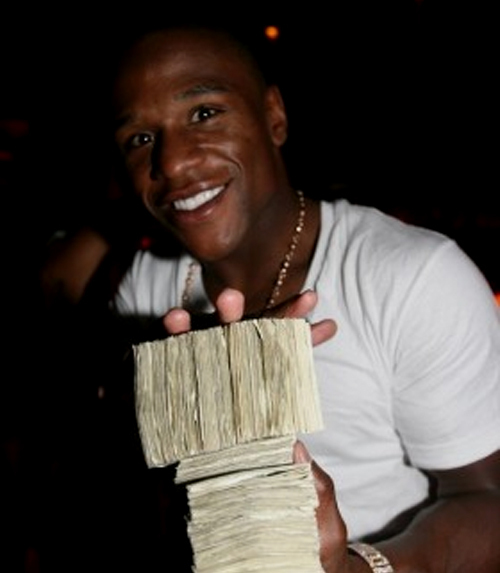 Not knocking Floyd Mayweather, but he knows he couldn’t draw flies to a dumpster until he beat Oscar De la Hoya. I know this is true because I was managing him when he couldn’t sell out his hometown of Grand Rapids or the San Francisco Auditorium, which only seats 6,000 people. If Mayweather had an Olympic medal, a big personality and several world titles yet still couldn’t sell tickets, shouldn’t we fault the people managing for not selling him correctly? Prince discusses Mayweather’s pre-2007 anonymity as if Prince played no role in making the fighter known to a broader audience. And pointing out that Mayweather wasn’t a big draw before defeating De La Hoya doesn’t remedy Ward’s dilemma. He’s not absolutely unknown — his 147,000-plus Twitter followers make him more popular in that space than half the teams in Major League Baseball. But he still has trouble selling tickets outside Oakland, is a long way from headlining a pay-per-view event, and even with his commentating gigs on HBO is struggling to establish a big enough following to make PPVs a possibility. Shouldn’t his manager be working to fix that problem? Yes, but remember this. Mayweather didn’t become a star until after he left Prince. Am I conflating correlation and causation here? Mayweather’s rant has earned Ward more publicity than Prince’s “managing.” So maybe instead of ripping Mayweather he should take notes on how this former client figured out how to win the fame game. 3. But Back to God — Mayweather has a point. So if we’re all God’s children but Jesus is God’s only Son, what is Andre Ward? God’s outside kid? Is God listing Andre Ward as a dependent on his tax returns? And while I’m sure Ward is devout, billions of other human beings are too, so what has he done to merit half-sibling-to-Jesus status? Expressing devotion and feeling thankful for blessings is one thing, but calling yourself the Son of God requires a self-righteous sanctimony not even Tim Tebow expresses — at least not in public. Smug piety like that would make Ward one of the most polarizing figures in sport if more fans cared who he was, except… well… see above. It also makes you wonder how Ward’s “Son of God” moniker would go over with the original Son of God. Again, I’m no religious scholar but I can’t imagine that level of hubris sitting well with a man who so prized compassion and humility — the very two qualities that would keep Jesus from backhanding Ward for his insolence. 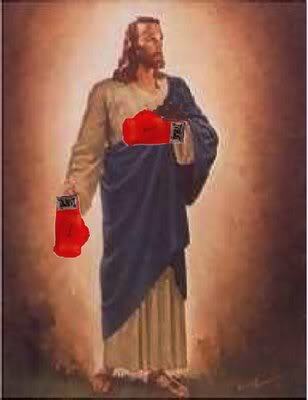 Yes, I understand Ward is the second-best pound-for-pound fighter on the planet while Jesus was but a humble carpenter. But Jesus walks across ponds, conjures an entire banquet from two loaves of bread and turns water into wine with the power of his mind. He’d figure out a way to outbox Ward. And if not, he’d win the decision anyway because God would take a sudden interest in sports and rig the outcome in favour of his son. Andre Ward’s “Son of God” moniker is simply taken from the Bible where God tells us he is our Father and we are all his sons and daughters (2 Corinthians 6:18). And Ephesians 1 goes even further to say we have been adopted by God to be His sons and daughters. I think Mayweather and Morgan Campbell have taken the whole thing a bit too far. Seriously…do a bit of research in the world’s bestselling book of all time before questioning someone as solid and decent as Andre Ward. Since the fight is on Showtime, Mayweather vs Guerrero is getting more promotion than it would have on HBO because CBS is a partner too. This will be entertaining to watch, I wonder how Mayweather will do since he hasn’t fought in a while. I’m watching all the videos at http://Mayweather-Guerrero.org and Money May looks pumped! Great insight regarding the managerial impotence of James Prince. Ward would do his fiscal health and career a service to look elsewhere.